Classic Ford Woody Woodie surf beach cruiser auto biography. 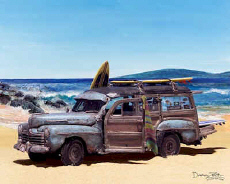 Story includes history, facts, and information about Ford Woody surf surfing station wagon. Ford Woody nostalgic surf beach buggy Cruiser. Ford Woody Woodie Story. It was a vibrant spring day -- April 7, 1947 -- when I rolled off the Dearborn assembly line. As fate would have it this was the same day the man whose name I proudly bore, Henry Ford, passed away. It had been a hectic couple of years since the end of World War II. The Ford Motor Company along with the rest of the automobile manufacturers had returned to civilian car production with a vengeance. Demand far outstripped supply. The Big Three all used little changed pre-war body dies, although Ford did offer an improved Flathead V-8 that now generated an even 100 horsepower. I was one of 16,000 station wagons Ford would produce in 1947. As part of the top-of-the-line Super DeLuxe series I comfortably seated eight passengers, weighed a hefty 3500 pounds and carried an "outrageous" price tag of nearly $2000. It was a different world in those days. Mr. Truman was in the White House. Most people had never heard of television. And the war-weary Greatest Generation sought only a return to the normal everyday life the war had taken from them. For many obtaining a new car was a top priority. Dealers of all makes made small fortunes as the public literally lined up outside the showroom door to purchase any car they could get their hands on. Dealers especially loved station wagons and convertibles because of their higher profit margin. All manner of optional equipment -- fog lights, sun visors, spotlights, radios, white sidewall tires, deluxe steering wheels -- all added to the cost. But a car-hungry public readily accepted this as the cost of obtaining of a new car. Sporting a shiny coat of maroon paint, which contrasted beautifully with my birch paneling and maple wood trim, I was ready to begin life. I soon found myself loaded atop a semi-trailer transport truck that was to deliver me to a local dealer and my first home, a small town in northwestern Illinois not far from the banks of the Mighty Mississippi. "Careful as you back down!" The voice broke my reverie as I slowly descended the steep transport ramp and prepared to greet my new life. "Clean up that woody and take it over to the Glenview," I heard a voice say. Barely an hour later I was driven across town to my new home, the Hotel Glenview. The hotel was a stately three-story brick structure that exuded a quiet dignity I instantly fell in love with. The next day the words "Hotel Glenview Coach" were beautifully scripted in gold letters on my front doors. I learned that my primary assignment would be to shuttle arriving and departing hotel guests back and forth to the Milwaukee Railroad train-station depot located about two miles away. With my third-row seat removed I could carry four or five passengers and their luggage with ease. My life was defined by idyllic routine. When I was not meeting trains I often transported hotel guests to nearby destinations and gave short tours of the surrounding farmlands -- rolling hillsides painted with waves of tall green corn. Life was good at the Glenview. I was dusted at least once a day and at the first hint of dirt I was gently washed. Frequent polishing of my metal and chrome, and a twice a year re-varnishing of my wood were the order of the day. And in the winter I even enjoyed the unheard of luxury of a heated garage. Life was good. Our small town had its share of prominent visitors, but the autumn of 1952 brought increased excitement when General Eisenhower stayed over at the Glenview during his presidential campaign. Normally VIPs rode in a newer all metal body station wagon the hotel had acquired, but on this occasion I was the vehicle of choice per the General himself. "No, I'll take this one," he said. "I think a station wagon should be made out of real wood. I have one just like this back on my Gettysburg farm." It was an unmatched moment of pride. Ramblers! It was 1956 when one day I learned the hotel was purchasing three new Nash Rambler Cross Country station wagons. It was clear that after nine wonderful years my comfortable life at the Glenview was coming to an end. I felt both excitement and apprehension about the unknown that lay ahead. "May I practice my speech?" I had been on the used car lot for only a few days when a kindly Baptist minister from northern Virginia bought me. Immediately we headed east and I began my new life serving as an all-purpose car for his church congregation. Sometimes a Sunday School class would pile in ten or twelve at a time, overflowing my three rows of seats. Other times I carried succulent offerings prepared for church dinners and church outings. On one occasion I was even lent to a young couple who had just been married in the church. They didn't own a car and I provided a means for them to go on a short honeymoon. But whatever my task, I was always driven carefully and treated with respect. The years passed most pleasantly. It was a stifling day in August of 1963 when my owner met a fellow minister at the Washington, D.C. airport. "If you don't mind, may I practice my speech while we drive?" the stranger asked. As we drove toward the Lincoln Monument we listened -- utterly spellbound. "My God," my owner softly whispered. "You have written the Gettysburg Address for Our People." Briefly hesitating he added, "I especially like your use of the phrase 'I have a dream' a time or two near the end of the speech. May I humbly suggest you enumerate about a half dozen more of Our Dreams -- and each time repeat the phrase 'I have a dream'. Let it build and climax in a giant crescendo that will be remembered for all time!" My owner and I had witnessed and in our own small way contributed to a moment in history. And so it was a sad day when several years later I was informed that the church, having now grown considerably in size, had decided to buy a small bus. I knew the church's meager budget did not allow for two vehicles and I was heartbroken, although I tried hard not to let it show. I fought back the tears and tried to demonstrate a quiet dignity in keeping with that which I had been privileged to have been surrounded by. I had left the Glenview with a sense of apprehension. I was now leaving my minister and the church congregation with a profound sense of sadness. "This is the car I was talking about, Brian. The wood is in really great shape. We can paint it and shine it up and it'll make a perfect prop." I was perplexed, but the next day I found myself on a trailer headed west cross-country. Only a week later I emerged from a Los Angeles body and paint shop looking brand new. What a fantastic feeling! I also found myself adorned with a new roof rack that had two shiny colorful surfboards mounted on it! "One, two. One, two, three, four. Everybody's gone surfin', Surfin' USA." The crowd roared! Surrounded by potted palms, surfboards, amplifiers and giant speakers, I was now part of the Beach Boys concert stage show. What a life! Carefully driven from city to city I was polished before every show. During rehearsals I took the stage and then patiently waited for an evening of great music -- not to mention the admiring looks of thousands of fans. I enjoyed the privileges of celebrity with none of the responsibility. Young all over again, I was living a fantasy few woodies could ever dream of! In 1968 a real life drama briefly took center stage. It was an era when protest was the order of the day. While waiting alone on stage I became aware my tailgate window was being raised and someone was placing a package on my third-row seat. Instinctively I suspected it might be a bomb. I waited nervously as the crowd began to arrive, but no one noticed the suspicious package. I felt the extreme urgency of the situation. I had to call out the only way I could. Blasting my horn as if it were stuck brought attention and the needed help. "This would have blown away the entire stage," the bomb-squad captain said. "What a lucky coincidence the woody's horn would go off all by itself!" Too soon the sixties transitioned into the seventies. Concerts became fewer and at a quarter of a century in age I once again found myself up for sale. General Eisenhower, Dr. King, the Beach Boys -- it had been a great run. Forrest Gump had nothing on me! I was feeling the ravages of wear and tear as well as just plain old age like never before. My life seemed to be in a state of ever-accelerating deterioration. In what seemed like an instant, I had become nothing more than a glorified cargo truck for an endless string of very forgettable owners. I hauled melons in Moline, pigs in Paducah, and trash in Tulsa. Life no longer held any joy. As the years blurred I found myself out west working in towns from Yuma to Yakima, and everywhere in between. I was now thirty years old and clearly my best days were behind me. I often consoled myself with memories of the wonderful and privileged life I had known. As I crisscrossed the country I often reflected back on the glorious years I toured with the Beach Boys. Now that was the way to see America! But time was no longer my friend and happy moments were few and far between. Ironically one of the rare bright spots in my life during this period occurred outside the United States in the rugged wilderness of Saskatchewan, Canada. I was a carryall at a "Boys' Ranch", a nice name for a reform school. I enjoyed the healthy outdoor life style that seemed to serve many of the boys so well. In the evening I was especially popular with the boys as they would often sneak out of their dormitory and gather around me to listen to my radio. I was old enough that no ignition key was needed to turn on my radio. From hard metal to disco to the Bee Gees -- I loved it all. "Hey, I used to tour with the Beach Boys!" But of course they couldn't hear me -- and I doubt any would have been the least bit impressed anyway. I liked most of the boys although a few did seem incorrigible, especially the one who displayed the indignity of carving his initials, "D.R. ", in my wood. I think it must have stood for "damn retard". But all in all, Saskatchewan was not bad. Frankly, it was the only "home" during this period of my life that I even care to remember. Things seemed to be on a non-stop downhill slide. I really didn't think my life could get much worse, but I was about to be proven wrong. It would be a misstatement to say that the quality of my life had deteriorated. There was no quality. From Saskatchewan I eventually headed even farther north. I was driven up the Alcan Highway to Alaska. There I continued to work hard until one day my trusty Flathead V-8 could simply go on no longer. I was abandoned along a backcountry road many miles from the nearest civilization. There were many days when not a single car passed by. The winter cold was unbearable and the passing of the seasons took a relentless toll. I was resigned to spend eternity in the never-ending ice-hell I called Nowhere, Alaska. "Has this got beach written all over it or what!" As I slowly emerged from my drowsy state of hibernation, I realized two young men were examining every wrinkle and scar on my rusted and battered body. "If we can haul this piece of junk back down to Malibu we can make a fast buck selling it to some surfer." Although I wasn't offended at being called junk, I really didn't approve of the mercenary tone of their words. But all I could think about was the warm California sun. I offered no resistance as they loaded me on the back of their flatbed truck. A week later I found myself parked along a busy street in Malibu with a For Sale sign in my window. Two or three people a day looked me over. However my sad state of repair, especially my decaying wood panels, made anything but a good first impression. I was quickly losing hope. Then one afternoon a young man who looked to be in his late twenties slowly walked up to me. There was an air of familiarity in his manner -- I felt as if I knew him. I sensed instantly that he wanted me and the following day he returned to tow me away. As he attached me behind his pickup he whispered, "Hi! My name's Dave, and you're about to start a new life as my own special beach cruiser. I've dreamed about a woody like you for a long time, Little Buddy." It was all too much. Somehow I had been saved from a frozen eternity in Alaska. It was as if I had died and gone to Heaven, otherwise known as Malibu Beach. As my new owner worked on my engine I felt the skilled yet gentle hands of a caring mechanic. "I hope you understand that I can't really afford to fix your body, Little Buddy," he said. "It would be futile what with the salt air and all." He continued, "You know, I once lived at a place that had a woody just like you." Chuckling, he added, "I was a pretty wild child back then. But that was in Canada and the woody I knew there was maroon, not blue." It was him -- the retard! Now I knew why he seemed so familiar. My new owner was none other than the kid at the boys' ranch who had so brazenly carved his initials in my wood! The initials were still there but long ago they had been covered up when a bumper sticker was slapped over them. And along the way one of my owners had painted me blue. But my faith in humanity was restored. If there was ever a case of a wayward kid turning his life around, Dave was it. He had grown up to be a hard working and considerate person. I was now proud to carry his initials, even if he didn't know. Then came the most incredible surprise of my life, even topping Malibu. "Better start practicing your hula moves, Little Buddy. We're going to Maui!" I was in a state of euphoric disbelief. "I got a job shaping surfboards for a shop in Kihei", he continued. "From now on it's sun and endless golden beaches for us!" In less than two weeks I was loaded aboard a Matson transport ship and on my way. A few days later I arrived in Honolulu and was immediately transferred to an inter-island barge bound for Maui. Dave and I enjoy a wonderful life. Weekdays are usually spent parked in front of the surf shop where my owner works. With an array of surfboards strapped to my roof rack I earn my keep, serving as a unique billboard for the shop. All day long an endless chain of tourists in their rental cars stream by. Many make U-turns and pull into the surf shop parking lot to admire me and often to pose for a picture next to me. "Can you imagine the life this old Ford must have lived?" is a common comment, as is "What a story I bet this old Cruiser could tell." Yes sir! Yes indeed. Life is truly good. Few are so fortunate as to spend their Golden Years lounging on the soft sand beaches on Maui. There isn't a beach on the island that Dave and I haven't been to innumerable times. Wherever there's a swell and the waves are breaking, that's where we are. Whether it's before work, after work or on a day off, Dave and I traverse the island endlessly in search of that one perfect wave. From Flemings Beach to Launiupoko Park -- from Kamaole Beach Park to Makena Beach -- from Spreckelsville to Kanaha Beach -- this is my life, my wonderful life. All are fantastic beaches, but my favorite has to be Hookipa Beach. Located just outside the old plantation town of Paia, Hookipa Beach is the Windsurfing Capital of the world. It is also a gathering place for old Cruisers like myself. There might be a few who are appalled by our looks, but our rust and our dings are simply the scars of a rich and full life -- and we wear them proudly. My fellow Cruisers and I are unanimous. Each of us would far rather meet our Maker on a sunny Maui beach than to be preserved forever within the sterile confines of some climate-controlled automobile museum. "What a neat woody!" (Older people call me neat.) "What a cool Cruiser!" (Younger people call me cool.) To me they're both words of love, which I will never grow tired of hearing. Tourists' cameras click photos of me all day long. If I had a nickel for every picture I have posed for I'd be rich. But then I already am. And so as I look back on a half century plus of life, I truly have no regrets. I now have but two wishes. One is to continue to faithfully carry Dave from beach to beach endlessly. And maybe someday my second wish will come true too. That will be the day the "damn retard" peels that sticker off and exposes the "D.R." he carved all those years ago in far off Saskatchewan. I know what his first words will be. "I knew there was something special about you all along, Little Buddy. That blue paint didn't fool me for a second. Surf's up. Let's go!"